Mexico continues to see an increase of tourism and it’s easy to see why! Not only do they have fabulous resorts and beaches, but their people are truly welcoming. As one of the best value vacation package options around, Mexico offers all-inclusive resorts that give way for a free relaxing environment where nearly all of your needs (often including the beach) are in one place. Almost everything you can think of is included in your travel cost, which means when you arrive, you don’t have to worry about taking out your wallet. In other words, it’s paradise. Remember that while all-inclusive resorts include a big chunk of your vacation cost, outside excursions, spa treatments, and other extra activities may have an additional charge. Check with your resort for their specific inclusions! Where can you find an all-inclusive resort? Think warm! You can find them in Puerto Vallarta, Cancun, Cabo, many places in the Caribbean and more! Some resorts are close to favorite tourist spots that are well worth the visit. Unfortunately, Hawaii does not offer all-inclusive resorts. Is an all-inclusive resort for you? A big part of all-inclusive vacations include the beach. So, if you are a “beach lover” and are content to spend a good portion of your vacation at the resort, then it’s a perfect idea! Otherwise, it may not be your type of vacation. Many resorts also have nearby excursions. For example, Cancun all-inclusive resorts is the ideal place to stay when seeing the ruins of Chichen Itza. Plus, what better way to enjoy tourist attractions than with the comfort of a close and safe resort? We know that it isn’t just about where you stay that matters, it’s also about the people. Their hospitality can make or break a vacation and that’s why it’s so important to grab a travel agent on board with your vacation plans. 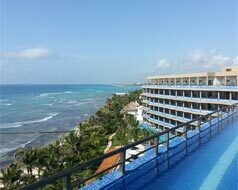 Cancun all-inclusive resorts and others like it can provide more than monetary savings. They can provide charisma and friendship that will have you dreaming of returning again and again. There is no better way to vacation in Mexico than to stay at an all-inclusive resort.